You might never have heard of Pure, especially if you live in America, but it's a British brand that has built a tremendous reputation for solid, well-engineered DAB radios - and DAB doesn't exist in the US. 'Solid' might give the impression that Pure's stuff might be a little staid, and it's true that the radios it's best known for have a certain boxy, wooden, let's-call-it-classic feel, so this new Contour range is something of a departure. It still feels like a Pure product, though. The build quality is good, the design well thought-through, and in general we'd feel good about owning one. The DAB system is clean and easy to use, and there's FM as well if you live in an area where DAB is either non-existent or too weak to tune into. The reason we're reviewing it, though, is that it also has a dock connector so you can charge and play music from your iPhone or iPod - and even from the iPad. Rather than putting the dock connector on the top where the device would be unsupported and would spoil the line of the Contour 100Di, you press the corner of the panel next to 'Pure', and the dock rotates out smoothly. It's commendably robust too, and feels like it would last for years. The little rubber nub you can see halfway up the speaker in the picture above acts as a rest for the iPhone or iPod to lean against so it feels secure, and even when you put an iPad into the dock, the whole setup is really stable. There are other good design touches as well; the remote control, for example, latches magnetically into a recess on the back. Ironically, though, the remote itself is a bad design; the grid of buttons is undifferentiated, making it impossible to identify functions by touch alone. We've been listening to Pure radios for years, and this new model sounds just like its older siblings. And that's actually a compliment - though one with caveats. The audio from the 100Di is clean and clear. It sounds great for almost everything at low volumes - when used as a bedside radio, for example - and its great to find a speaker with small enough volume increments that it's easy to find a comfortable listening level even in a silent room. Start cranking it up, however, and it starts to feel a little light, a little thin, when playing music. Note that it never sounds like it's struggling - rather, it's almost like the radio has decided to be very good at calmly and clearly reproducing the speech of Radio 4, say, and finds Radio 1 just a trifle brash. Imagine Jeeves singing Rihanna, if you will. Regardless, nobody would call the audio from this as anything other than good. It doesn't match our Tap! 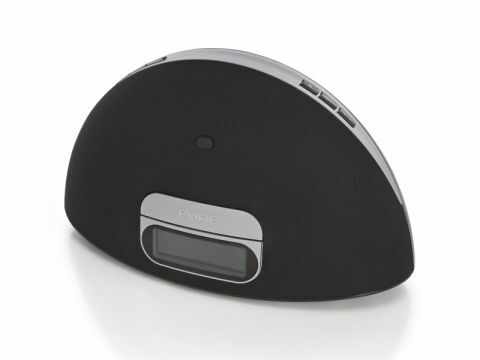 Top 50-listed Logitech S715i for pure music fidelity and richness, but it is overall a great speaker dock for the bedroom, kitchen or small lounge - and remember that it also works well with an iPad. Yes, you could add digital radio stations to just about any dock with an app such as TuneIn Radio, but we like just being able quickly to switch on the radio rather than tapping through an app. We like this. It's well designed, well specced and well built.